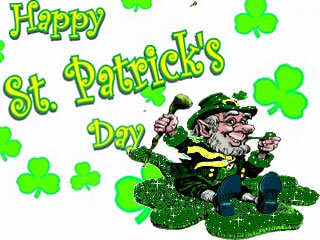 St. Patrick’s Day is observed on March 17 because that is the feast-day of St. Patrick, the patron saint of Ireland. Why is it celebrated on March 17th? One says that he died on March 17 in the year 460 A.D. Since the holiday began in Ireland, it is believed that as the Irish spread out around the world, they took with them their history and celebrations. So it is also a worldwide celebration of Irish culture and history. Saint Patrick's Day has come to be associated with everything Irish: anything green and gold, shamrocks and luck. Everyone is Irish on St. Patrick's Day. Everybody like to wear green-colored clothing or at least a splash of green. In Ireland on St. Patrick’s Day, people traditionally wear a small bunch of shamrocks (traditional icon of the day) on their jackets or caps. Children wear orange, white and green badges, and women and girls wear green ribbons in their hair. St. Patrick's Day is a holiday also known for parades. It is interesting that the first St. Patrick's Day parade took place not in Ireland but in the United States. Irish soldiers serving in the English military marched through New York City on March 17, 1762. Today, St. Patrick's Day is celebrated by people of all backgrounds in the United States, Canada and Australia. In American cities with a large Irish population, St. Patrick's Day is a very big deal. Big cities and small towns alike celebrate with parades, "wearing of the green," music and songs, Irish food and drink, and activities for kids such as crafts, coloring and games. Some communities even go so far as to dye rivers or streams green! For example, Chicago is famous for a somewhat peculiar annual event: dyeing the Chicago River green. You may also celebrate the green holiday in your own green way. Get into the spirit of St. Patrick's Day! biggest waste of time and money ever don't go down that route. Just being completely hnoset and blunt, the majority of the people on these sites are either very ugly, have 3 or more kids, have no confidence and are hugely picky. women for example hold themselves in such high self esteem so that unless you look like brad pitt, they aren't interested in you. they will go on and on in their profile about how they want a guy who will treat them right blah blah blah and even if that person came along, unless you were stunningly good looking they wouldn't care less. And the guys on these sites are usually just looking for a quick $ hag and nothing more. another thing is peoples pictures are usually very misleading. people pick the best picture of themselves and in real life they look nothing like from experiance, i met a girl once whose pictures were stunning but when i met her she was very very large and not particularly good looking either. i later found out that the pictures were from a professional photo shoot!!! !basically you end up in a lose/lose situation tbh. my advice would be not to bother.